The vacation rental industry is now over $85bn annually, and is growing rapidly. In the US alone, vacation rentals make up 20% of the total accommodation market and 7% of the total travel industry. As a first step towards generating additional income, owners are listing their properties on vacation rental portals such as AirBnb, HomeAway/VRBO or TripAdvisor/Flipkey. However, an increasing number of owners are becoming completely dependent on these portals for their bookings. What’s the problem with this you may ask? Owners are not maximizing their potential revenue from their properties. And that’s a problem. This “leakage” is caused in two ways. Portals such as AirBnb charge referral fees and commissions for each booking made. Also, portals have no incentive to help property owners generate repeat business from previous tenants, as they miss out on the booking commission the second (and subsequent) time around if guests go direct to owners without booking through the portal. The most successful property owners maximize the revenue per booking by becoming independent from major vacation rental listing portals as soon as possible. They focus on converting new leads to repeat business and lifelong renters. They focus on generating repeat bookings by providing guests with a superior experience, from booking to departure, meaning that not only are guests likely to return, but they are likely to tell their friends and family. And these guests book direct with the owner, meaning owners don’t need to pay commissions to the various portals. This strategic move toward becoming independent is conceptualized by blogger Matt Landau in his infamous Listing Site Independence(LSI) graph. Owners should have it in mind to move towards independence from portals, which will allow them to maximize the potential revenue generated from their vacation rental. This second phase is about introspecting a bit a finding what makes your business attractive, unique if possible. Once you find that identity, you need to let the world know you exist. It is likely that you will need to start off by listing your property on the various vacation rental portals that exist today. In addition to this, look for travel forums and sites where people are talking about accommodation for holidays and short term, and contribute to those conversations. As a start, also use your social media accounts to start spreading the word that you’re now live! It’s amazing how many friends you have who may know people looking to rent a place for their vacation. There are many touch points along the vacation rental customer journey – from you listing your property online, right through to cleaning the property once a guest leaves. Even if you only have one property, you will be getting enquiries from different people on different sites that you may not see come through because you’re at work, you will need to send various responses and instructions, manage and update your calendar, make sure your pricing is competitive and reflects the market, arrange entry for guests, be on hand during their stay, facilitate payment, arrange cleaning, and the list goes on (and ON). Many people have more than one vacation rental property which further increases complexity. At this stage, you realize that you may need some help. But never fear, because help exists. 4. The streamlining and automation phase – make it easy for you and your guests! Fortunately, there are now products coming onto the VR market that assist you managing your vacation rental/s – whether you’re an individual managing one or two properties, or a professional agent managing hundreds of properties. From calendar and pricing management to automated emails and entry codes, products now exist to help you manage your vacation rental. One-stop management shop platforms like Orbirental, which integrates with various best practice partners in the VR space like BeyondPricing (pricing automation) or IglooHome (home automation), will become your friend. You can manage and respond to leads quickly, make sure your pricing is optimized for the market, automate as many processes along the customer journey as possible (such as the delivery of instructions, key codes, payments etc), and also automate various activities once the guests leave – such as having the house cleaned. Not only does this make your life easier as a property owner, but also it provides for a sensational experience for your guest, meaning they are likely to return and tell their friends and family to do the same. Orbirental will also provide you with direct qualified leads through our integration with meta search engines such as Tripping.com or HomeToGo, bringing you booking inquiries directly into your customized workflow. 5. Independence – all your booking revenue is yours to keep! 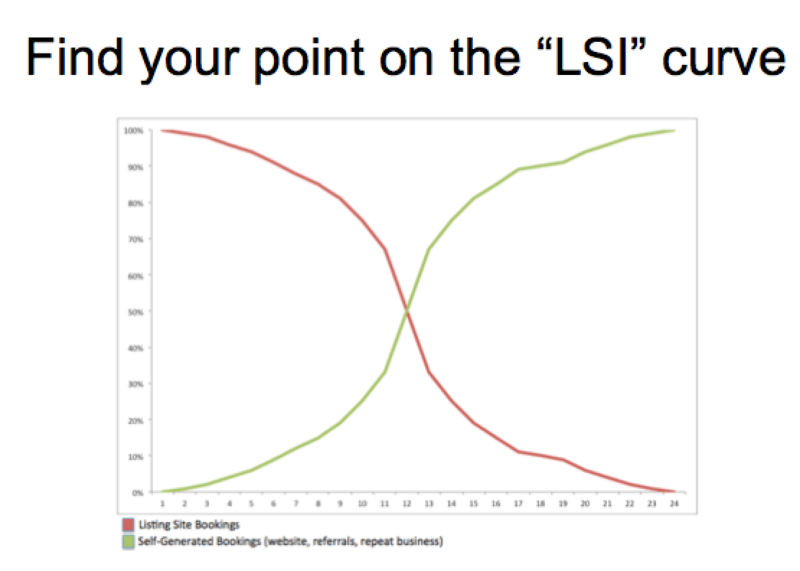 With new leads generated by repeat customers and word of mouth referrals, you will move along the LSI curve and approach full independence, meaning your booking revenue will be yours to keep, and not share. Now who doesn’t want that! Thanks for the shout-out Steph! To summarize my big takeaway from our chat on the phone just now for other readers, listing sites do indeed play an important role in our industry (from introducing new travelers to the industry to allowing owners to become mini-hoteliers overnight). The “trick” is to understanding where they fit, deciding what you (the owner/manager) want, and using those companies to help you achieve your VR dreams. Great post and congrats on the Tripping.com news! Thank you Matt – you deserve much of the credit for nurturing those ideas in your awesome Inner Circle. Steph, good post. It covers a lot of things that new and growing owners need to be aware of. I also believe these marketing channels have value, and it’s important to figure out what that value is. I don’t think the goal is to kick them out of the car, I think the goal is to put yourself as an owner in the driver’s seat so that you get the best of both worlds while leveraging what is in your best interest as an owner. As an owner, my main issue with these guys or moving toward independence IS NOT avoiding their commission fees. People get paid when they bring value. I move toward the driver’s seat as much as I can because some of the method’s they use beyond the value they bring, unnecessarily stifle the value proposition I have as a company. So finding a better harmonious balance is key. Let’s take for example the airbnb referrals and reviews. Airbnb provides incredible value to VR owners. We get access to millions of vacationers that we simply would not get access to otherwise. So to me their commission fees are justified. But like you’ve said, we want ways have return guests too, who enjoy what we offer and want to share it. So they come, they stay, they enjoy, and when they leave, they write a great review on airbnb and guess what, it brings more business. What I would like to do is not pluck them out of the airbnb system, but have their review shared with my site too. Everyone has a wall around their reviews but it is my property and I should have some say as I’m the key element in providing that experience everyone is writing about. So if they were open to exporting reviews, instead of me having 3 on airbnb, 2 homeaway and none on tripadvisor, each potential customer could have a better idea of how much value we are really bringing. My site and airbnb’s site can show the review and if it was linked back to the original airbnb review, then the guest reading it on my site or any other wouldn’t have to worry about the authenticity of the review (much like Amazon’s “verified purchase” ). Another place where this harmony and better balance is necessary is the recommendations of other properties. Orbirental does a good job of prioritizing offering a list of alternatives to potential guests by showing other properties by the same owner first. I wish this practice was more widespread instead of luring my potential guest away by recommending other properties even before showing what else I have to offer. So there is work to be done for sure. On a related note, I’ve noticed that that hotels and airlines have already gone through what VR market is going through. They did it all before, then the Expedia’s and Priceline’s really muscled in and tried to be the dictator on the hill, but they both realized that in the end they all service the customer and benefit from a growing market and are learning to play nicer to the benefit of all. Hey Duran – thanks for those very argumented comments. We totally agree with your statements and listing sites definitely play an important role in the ecosystem. I guess the main point we’re trying to make is that PMs and property owners go through phases in the process of optimizing their business, and that those sites can be great help initially but their interests can be somewhat antagonistic with the interests of a PM in the long term. Also, as the industry is going through what some call a “hotelization” process (meaning that guests expectations are increasing and IB is becoming the norm), owners and PMs need to professionalize their activity and this means getting the tools necessary to run their business effectively and optimally. While doing so, they will start to treat listing sites as simple channels and be able to arbitrage the leads they get in order to increase rental revenue and decrease dependency on any particular channel.